Mom, the Intern: Update and bat cave how-to. Update and bat cave how-to. If you're friends with me on Facebook, you may already know that I was selected to serve as a juror for a trial this week. I will freely admit I had a bad attitude about jury duty in the past, mostly due to the stigma it carries as an inconvenience. While it is definitely inconvenient, I feel it is an absolutely necessary part of maintaining the freedom of society. The fact that you, or I, or anyone else can count on a trial by jury of peers in the event that they are accused of wrongdoing is an essential principle of liberty. And as a person who is confident she can remain unbiased and discern truth, I am honored to serve in this capacity. I have been admonished by the court not to discuss the case until I have been released from my duty as a juror, which will happen this Thursday evening. I may choose to blog about my experience more fully at that point, or I may not. In any case, I hope that I can discuss it in a way that will be helpful to others while respecting the judicial system and the dignity of those involved in the case. I, for one, had very little idea how this whole process even worked until yesterday. I wonder if many of my peers, who may also be selected for jury duty, feel similarly. It might be enlightening to hear a first-hand account of what occurs during a trial. That being said, I wanted to teach you how to make the cute Halloween crafts I posted on Friday, but I'm not sure if I will have time this week. I'll start today with the bat cave and we'll see how it goes! 1. Start by making the stalactites for your cave. These are the icicle-like formations that hang from the top. Turn one poster board on its side and begin roughly drawing the stalactites using the edge as the top of your cave. Go crazy. Don't worry about it being perfect because nature isn't perfect and it will look awesome no matter what you do.The straight corner and edge will go in the corner of your wall, so make sure you draw the formations from the correct side! Remember that the cave is going to be hanging on a probably-large wall, so make them longer and fatter than you would think. 2. Cut out your stalactites. If you want your cave to be longer that one poster board, draw some more stalactites on the second poster board like I did. I recommend you make three different sizes, and 2-4 bats of each size. 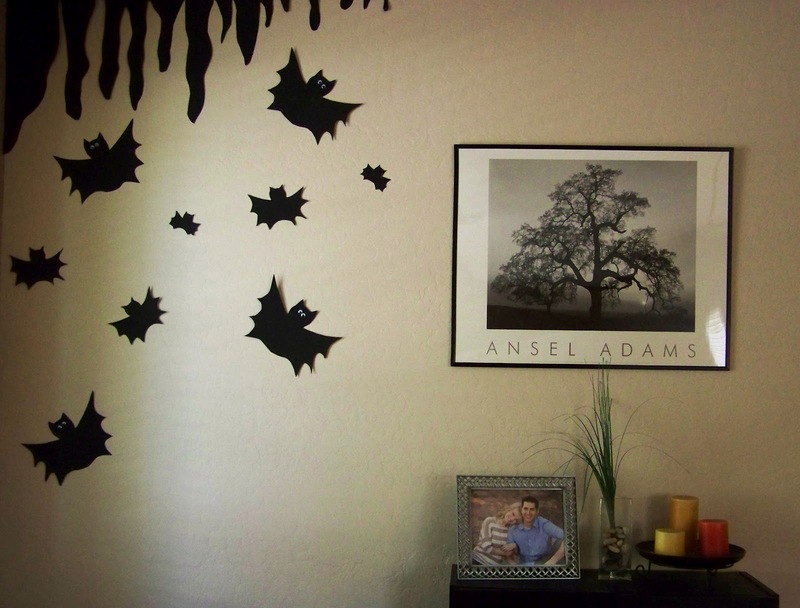 You could even make some hanging bats if you're adventurous. I prefer to keep it simple for my own sanity, so all mine are flying. 5. Stick your stalactites up on the wall. Make sure they're flush to the corner! Now, you can put your bats up since you kindly provided them with a home. Space them out and mix 'em up a little -- this might take you a few tries, if you're like me. But have patience, because when you're done, you'll have a super-cute bat cave that your kids (if you have them) will love. In fact, I should warn you that they might cry when you take them down in November. So be ready for that. i was picked to be on a jury a few years ago. it was a one day trial. which was nice, but i ended up being picked as the alternate and was sent home so i didn't even get to deliberate with everyone, it was the PITS!!!!! i never found out what the verdict was. it was a let down for sure. love the bat cave. i'm not sure if i'll put my flock of bats on my front door again this year. Like Elise said, as a lawyer's wife I won't be picked. Pro for all those years of schooling. :) My husband is actually a prosecutor and has to do trial cases. It's pretty interesting stuff. I agree, I have a lot of respect for the judicial system. Would be interested in hearing about your experience! whoa. sounds intense. I have never actually known anyone on a jury before. I bet it's not at all like the movies. Anyway, cool decorations :) I don't think I'd be talented enough with the scissors for mine to turn out quite as cute, but I might just give this a try!